By Sean Jones: Gennady Golovkin won’t be fighting interim WBC middleweight champion Jermall Charlo, according to GGG’s promoter Tom Loeffler, who doesn’t see any point in him taking that fight. 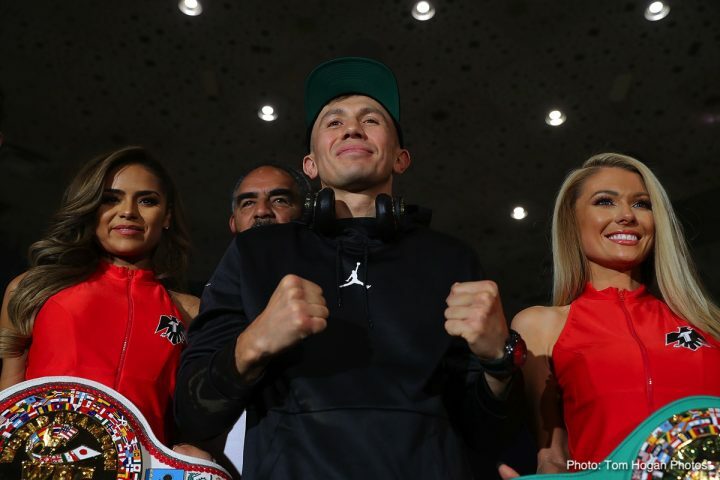 Loeffler wants the trilogy fight between Golovkin and Saul Caneo Alvarez in 2019. Whether that fight can happen will depend on Alvarez and his promoters at Golden Boy Promotions. Danny Jacobs won Golovkin’s vacant International Boxing Federation middleweight title last Saturday night in beating Sergiy Derevyanchenko by a close 12 round unanimous decision on HBO at Madison Square Garden in New York. Jacobs called Canelo Alvarez out after the fight, and his promoter Eddie Hearn of Matchroom Boxing USA seems to think that Golden Boy Promotions, the promoters for Canelo, will match Alvarez against Jacobs next May in 2019. Hearn and Jacobs think that Canelo has to take the fight with Canelo because he doesn’t have any other options for when he moves back down to 160 after he faces WBA ‘regular’ super middleweight champion Rocky Fielding on December 15. Loeffler says he’s going to be talking to ESPN and DAZN to see about finding Golovkin a broadcast platform for his fights now that his contract with HBO has expired. HBO won’t be broadcasting boxing after 2018, so that makes it imperative that GGG finds a network to fight on. Loeffler doesn’t want to go through Eddie Hearn of Mathroom Boxing USA or Golden Boy Promotions to sign a deal with DAZN. He wants to speak to DAZN themselves for him to negotiate a deal with their streaming platform and Golovkin. Loeffler says he’ll have Golovkin sign a deal with ESPN if DAZN requires that he use Hearn’s Matchroom company or Golden Boy as the go between. The WBC wants Golovkin to fight Charlo (27-0, 21 KOs) in what they consider to be a title defense for Jermall, and then they would order Canelo to face the winner. Since there’s no way of guaranteeing that Canelo would actually face the winner of the Golovkin vs. Charlo fight, it’s not a match that is worth taking for either guy. If Charlo waits around long enough, eventually the World Boxing Council will need to order Canelo to fight him due to him being his mandatory. Loeffler and Golovkin aren’t ducking Charlo out of fear. It’s more of a situation where there’s no money in a fight between them. Unless the Charlo vs. Golovkin fight is on PPV, it’s a fight that would bring in next to no money, and Golovkin would see himself take a huge pay cut from the money that he was making as a world champion for many years. Golovkin needs to face a world champion, not an interim champion like Charlo. Golovkin can go after fights against Brant, Jacobs or WBO champion Demetrius Andrade if he can’t get a third fight against Canelo Alvarez. Golovkin is heading towards a network that will make a fight between him and Charlo, 28, as highly unlikely to happen in this lifetime. Charlo is with Premier Boxing Champions with him being signed with Al Haymon. If Golovkin signs with ESPN at Top Rank Boxing or with DAZN, he’s not going to fight Charlo anyway. You can argue that the only way Golovkin and Charlo wind up facing each other is if GGG signs a deal with PBC, which it doesn’t appear that he’s on the verge of doing right now. The boxing fans are saying that Golovkin is ducking Charlo. From Golovkin’s perspective, it puts him in a one-down position if he agrees to the WBC’s decision for him to fight Charlo to earn a title shot against Canelo Alvarez. Golovkin obviously feels he’s beaten Canelo twice in a row, and that he should get the third fight based on the controversy of the first two. If Golovkin has to go out and earn a fight that he should be getting anyway, it makes it seem like he agrees with the judges’ decisions that he didn’t deserve wins over Canelo in their two fights. It’s in Golovkin’s best interest to fight whoever he wants, win a two or three fights, and wait for Canelo to agree to fight him a third time. Facing Jermall is a waste of time because there’s no money in that match, and there’s no way of knowing for sure whether Canelo aill agree to fight him even if he beats Jermall. Loeffler sees Golovkin as a star, and that it doesn’t matter if he signs with a different network platform as Canelo Alvarez. Last week, Canelo signed a 5-year deal with DAZN for 11 fights. Some boxing fans believe that the only way Golovkin can get a fight against Canelo is for him to sign with DAZN too. However, Loeffler thinks it won’t matter whether he’s with them or not. Loeffler sees Canelo as not having options with Canelo because he won’t fight Jacobs. The fight that Loeffler wanted to match Golovkin against was former World Boxing Association ‘regular’ middleweight champion Ryota Murata. That fight likely would have happened had Murata not been beaten this month by Rob Brant. Now that Murata no longer has the WBA world title, it’s likely that Loeffler will attempt to put a fight together between Golovkin and Brant. It’s a fight that would interest boxing fans, and it would given GGG a chance to win a world title that he can use to get a better deal for a trilogy fight against Canelo. Golovkin needs to make the right decision when it comes to signing with a platform, because he could limit himself if he signs with the wrong one. If Canelo and Golden Boy Promotions wants Golovkin to get in line and earn a third fight with Golovkin, then the trilogy match might not take place for a long time.